OPPO F7 review: It's Face Time! The Oppo F7 uses AI, to make your selfies look stunning. Oppo F7 introduces multiple artificial intelligence technologies to beef up selfies in various ways. In the crowded smart phone market today, there are run-of-the-mill selfie phones and then there are selfie phones that do justice to your face, even in extreme low light conditions. While some manufacturers play the camera specs game, others spend time and money on optimizing their camera tech. 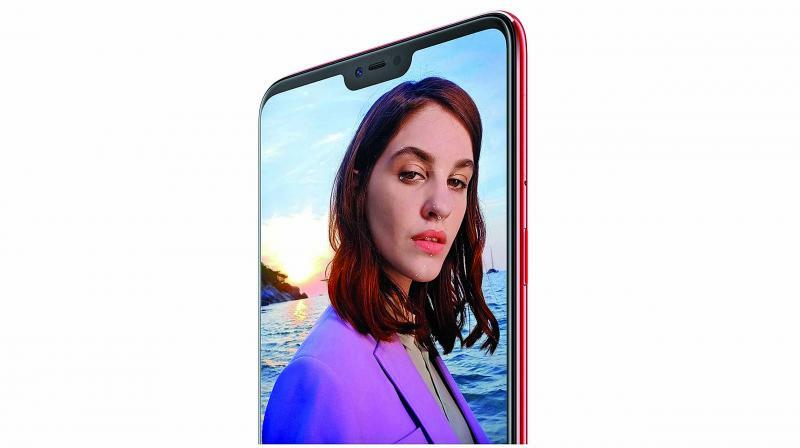 Now comes OPPO, with its latest offering -- the F7 -- that hikes up camera specs to a 25MP clicker, and introduces multiple artificial intelligence technologies to beef up selfies in various ways. With 370 patents in AI, the F7 has deliberately focused on users' front camera experience: It recognizes 296 facial feature spots, ie, it breaks down your face into a data matrix, with 296 attributes. Next, it classifies your images by gender, age, skin tone and skin type and uses 128 of these attributes for more efficient facial unlock. Step 3: It applies real-time beautification for different zones of your face, like the T zone, the eye zone and the U zone. If you visit a spa for facials, these are pretty familiar terms. Finally, it maps your face against 8,000,000 others around the world to find similarities and differences, essentially 'learning' from your face and adding it to the database for better intelligence next time around. For videos and images, the F7 recognizes 16 scenes ranging from night to sunset to beach, grass, food and fireworks and applies special filters and enhancements to bring out the attributes of the specific scene. The device uses AI also to learn from your own face — the more selfies your take, the more it learns about your face, and as you go along, makes your face look even better with all the intelligence the device gathered. This device also uses AI in for better battery management. It snoops around your device to understand your usage pattern and switches the cores of your processor on/off and allocates processing memory in real-time for apps, depending on usage trends. The F7 does all of this with a 25MP front and 16MP rear camera. The rear camera comes with a Sony 576 HDR sensor. Powered by a 3400mAh battery, the device comes with a large 6.23-inche screen and a 19:9 aspect ratio. The F7 is powered by an octa core 2GHz processor and comes in two memory variants. The 4GB + 64GB variant is priced at Rs 21,999 while the 6GB +128GB one at Rs 26,990. Available in Solar Red, Moonlight Silver and Diamond Black, the F7 goes on sale in Flipkart on April 2.